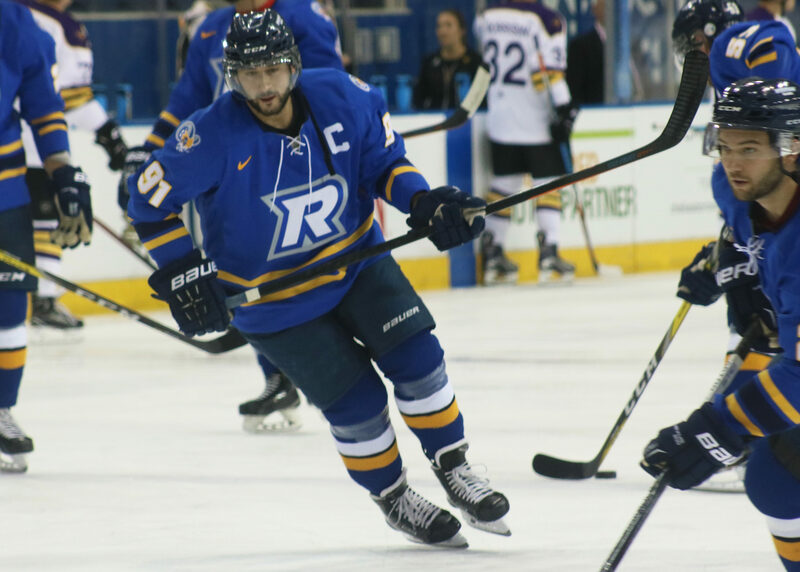 Growing up in Toronto, Ryerson Rams’ captain Michael Fine remembers watching his hockey idol, Doug Gilmour, play at Maple Leaf Gardens. Little did he know Gilmour would eventually become his coach, and that his career with the Rams would be spent playing under the same roof his favourite player once did. Fine’s hockey journey began at age three when his dad taught him how to skate. It wasn’t long after that Fine knew the sport would be a big part of his life. After playing seven seasons of minor hockey with the Mississauga IceDogs, Fine was selected in the third round of the OHL draft by the Sault Ste. Marie Greyhounds. With two seasons in the OHL under his belt, Fine was traded to the Kingston Frontenacs. The move not only brought him closer to home but provided the young forward with an opportunity of a lifetime. “Playing for Doug was a dream come true. He was my favourite hockey player but even more importantly he’s just a good person,” said Fine. It was during his two years at Kingston that Fine really developed as a player. Under the guidance of Gilmour, Fine recorded 95 points in two seasons. That was a vast improvement, after scoring only 54 points over his previous two years in Sault Ste. Marie. In his over-age year, Fine was traded to the Saginaw Spirit where he played his best season, recording 67 points. After completing his junior career, it was time for Fine to decide on which post-secondary school he would attend. For Fine, Ryerson was an opportunity to come back to where his love for hockey started. “After five years of junior, I didn’t get to see my friends grow up and I knew coming to Ryerson would bring me closer to my friends and family,” Fine said. Along with being closer to loved ones, the opportunity to play in the same building Gilmour wore the Maple Leaf in was too much for Fine to pass up. Since joining the Rams, Fine has showed steady improvement, increasing his point total in every season. Now in his fifth year, he sits as the Ryerson all-time leader in assists and is closing in on the all-time record in points. To compliment his historic numbers, he was also named to the U Sports all-star team for the first time in his career. Just last season, he scored the biggest goal of his university career: an overtime winner against the Guelph Griffins in the second round of playoffs to keep the Ram’s season alive. 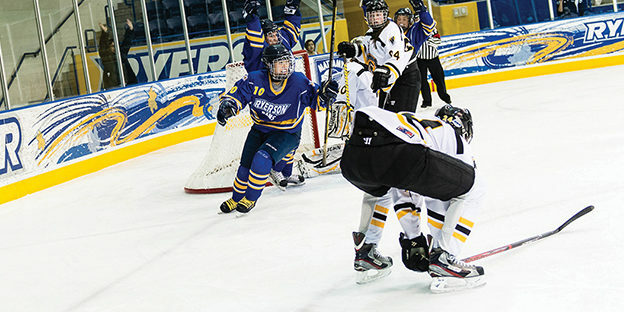 On the ice, Fine has cemented himself as an all-time great in Ryerson Men’s hockey history. But it’s his leadership and character off the ice that’s really impressed current interim coach, Johnny Duco. With Fine’s time winding down at Ryerson, one question remains: What’s next for the fifth-year forward’s career. “Since about September, I’ve had a couple emails a month from pro hockey teams asking to be the first team to know when Mike is ready to make a decision,” said Duco. Despite having goals of becoming a professional hockey player, Fine admits that his only focus right now is on Ryerson and winning a National Championship. However, when the day does come to make a decision, the mentorship of Hall of Famer Gilmour will be just a phone call away.